Greg Searle has a promise to deliver on. 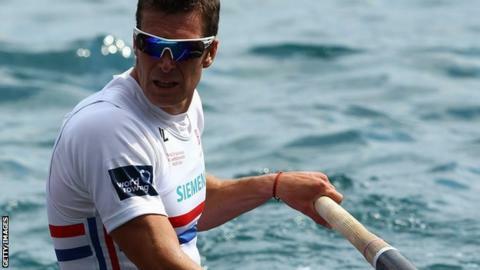 When the 40-year-old heavyweight rower, who won Olympic gold at Barcelona 1992, made the bold decision to come out of retirement three years before London for one last hurrah, the father-of-two knew there would be sacrifices. When he woke up on his 40th birthday, he did not see his kids or open any of his presents. Instead, he headed straight out on to the water to put himself through his paces in training. He also missed his daughter Josie's last day of primary school, could not play football in the garden with his son Adam for fear of hurting his back and would fall asleep on the sofa in the evenings from exhaustion while trying to catch up on time with his family. So before he put pen to paper to pick up his oars once more, Searle's two children, Josie, 11, and Adam, 9, came up with an "After the Olympics to-do list", which can be found in Searle's book If Not Now, When? and featured tasks their father needed to fulfil post-London - having retired for the final time - to make up for putting his life on hold. "We've got quite a bit done already," Searle, who won bronze in London, 20 years after winning gold with brother Jonny in Barcelona, told BBC Sport. "One of the first things we did was buy a dog. We said if I won gold, we would get a golden retriever, if we got silver, we would get a Weimaraner, and as it was we got bronze so we've got a Rhodesian Ridgeback which is a large brown dog with short hair. "She's fantastic and the best thing about winning a bronze medal. She's called Cobi - named after the Olympic mascot, which was a little dog, from Barcelona 1992." A holiday, their first in nearly three years, to Dubai followed just before Christmas while he is a lot more involved in family life, including doing the school run and helping his children with their homework which "they probably find annoying". Searle, a Plymouth Argyle supporter, has also started playing a bigger part in his children's sporting lives, whether it's umpiring one of his son's indoor cricket matches or coaching his daughter at swimming. "I think I have to coach someone," he said. "And Josie has volunteered to be my student. That prospect is certainly more attractive than needing to go off on a load of training camps. "It's nice to be around my kids when they're at the age when they want to talk to me. I recognise that I've probably got a four-year window, hopefully a bit longer, when that's the case. When my daughter is 16, I imagine I'm not going to be so involved in her life." There is still plenty to get through, though, including a balloon trip with his wife, a touring holiday in America, more indoor cricket with his son and plenty of cheerleading at his daughter's swimming galas. As well as all that catching up, Searle realises he needs to plan for the future. "I've got to think about what I'm going to do with my life after rowing," he added. "I feel very complete in my rowing career. Now I'm trying to make decisions that are right for me and my family." Britain's rowers lead a very regimented life. Each day is meticulously laid out for them so that the only thing they need to concern themselves with is their performance on the water. Leave that programme and you're on your own. "It's early days yet," he said. "I'm still figuring out how I'm going to be spending my time. I haven't got a steady pattern of what I do week after week. But I'm not afraid of that. I understand that is what it's like when you start something new. I've got to hold my nerve, work hard and let things fall in to place." But Searle, who is a partner in a performance development consultancy that advises companies on forward planning, is not done with rowing. "I'm doing a rowing coaching course," he said. "I'd love to be in a coaching or leadership role [in the national team]. I think I've got more skills to be [performance director] David Tanner rather than [men's head coach] Jurgen Grobler because I think that's a leadership role, which is something I do hands on day-to-day." And could we see him involved for Rio 2016? "It's conceivable but I don't feel that's the best place for me. Being a coach at national team level requires the same time commitment as an athlete and that's not what I want to be doing. If it was, I'd be an athlete. Now the focus is on the family. Coaching is a long-term aspiration." But Searle steered clear of making any rash comments similar to that of Sir Steve Redgrave, who famously said: "If you ever see me in a boat, you have permission to shoot me" after winning gold at Atlanta in 1996 before returning to win his fifth successive Olympic title at Sydney 2000. "I don't have any plans to stop rowing," he said. "I've not been looking after myself that much and not done much exercise since London because life has been busy. So I've set myself a New Year's resolutions to get fit because I don't want to become a lump of lard. "I've rejoined the gym, started playing more golf and I'm rowing with my brother Jonny." For now at least, Searle has his hands full coaching his daughter, supporting his son's cricket career and generally being a normal dad.